I don't want to be the Grinch . . . but I'm mad at the publishing biz. I wish that I could take my ball and go home. Have a tantrum, scream "No fair!" and slam the door to my room. So . . . the way out of this funk for me is writing, and to remember to practice principles before personalities. Nowhere is this more apropos in the world of publishing where it's really not personal that the business doesn't care about ME or my book, or YOU and your book. It cares about the bottom line, and so it should. My principles, in case anyone was wondering, are: honesty, hope, faith, courage, integrity, willingness, humility, brotherly love, self-discipline, perseverance, awareness, and service. This is where I practice the art of being human, and if I slip into Grinchy-mode for an hour or two, I can forgive myself and move on. It's progress, not perfection. And . . . I know that I'm a day late in announcements, but hopefully, the post-person will get these goodies to you by Friday, in time for Christmas if that is your celebration-of-choice. The winners are . . . Melissa B and Kelly Andrews! Shoot me your email guys or DM me on Twitter so that I can get your addresses, and you will get a care package! PS Thanks for reading - I feel better for the writing! 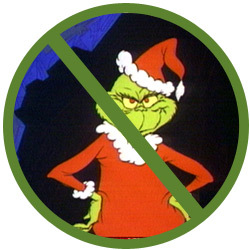 Good to see I'm not the only grinch this season. My fight is vs. Self though! My head seems to filter through a million ideas in a single day, so I can't get any real writing done! Hopefully my 3 week break from school gives me time to relax dewind and focus! And yes, we DO want those books! I had a publisher email me this week. They were rejecting my manuscript for publication. Hmm, thanks but please answer my email inquiring how they got my book proposal. A former editor of their's was interested over 3 years ago and left the company, so I never pursued sending him the entire manuscript. Is it possible his old accounts were processed this many years later? Glad I wasn't waiting to hear back. Lena, I guess it all comes down to the big bucks. Ah, my brethren! Wonderwegian, we will figure out a way to get books! And Ian - I am looking forward to seeing your ideas come to fruition - know that you are gaining life experience and ALWAYS marinating things! And btw, I will be in Mobile, Alabama March 1st - 4th - is that anywhere near you? Well, Alabama is just 3 states away. Now, should you ever come to Fort Worth, you would be in my hometown! :) Mobile is nice though! Drove through on the way to Leakycon over the summer. your principles are the same as mine and by the way, i think everybody slips into Grinch mode from time to time but that's why we have blogging as an outlet to release whatever we feel about something and of course the principles we have to make the right decisions and to act accordingly in different situations. Oh Ian. Of course Texas is too far! I am geographically challenged, for sure! Hello Erwin - thank you for introducing yourself! I love that you have joined the discussion from the Phillipines! Hang in there Lena -- of course you're not getting responses from anyone in the industry. It's December. No one's in the office again until the new year, when they'll be too BUSY to get back to you. Snort. Listen -- the industry's nuts. My book just got named to the "Best of the year" lists in the Globe & Mail and the Boston Globe, but a publisher here just turned it down because it "would be too much of a hard sell." Really? What the hell would an easy sell be? We go on, my friend, we go on. That story Lauren, is it's own special variety of nuts. I'll never forget what you reminded me of last year when I was in a down moment - that my writing is between me, and God. Have to remember always that this is not a competition or a popularity contest, but a journey through human-ness. Okay, that was a little lofty, but you get my drift! You now have solid figures in your grasp.